Reaching groundwater sustainability in the Tulare Lake Subbasin, and in subbasins across the State, will require periodic management adjustments. Not only will the formality of updating the Groundwater Sustainability Plan (GSP) every five years for mandatory resubmittal to CA Department of Water Resources call for adjustments, actually achieving sustainability will require learned modifications as time lends improved data and as the effects of implemented strategies are observed. The Tulare Lake Subbasin will soon have an estimation for the amount of groundwater overdraft in the subbasin. Each of the six GSAs within the subbasin will be responsible for a portion of the total overdraft amount. SGMA stipulates that all subbasins reach sustainability by the year 2040, correcting the groundwater overdraft and maintaining a sustainable level of groundwater use. Efforts to correct groundwater overdraft will include a number of varying projects and actions that will either increase the supply or decrease the demand for water. 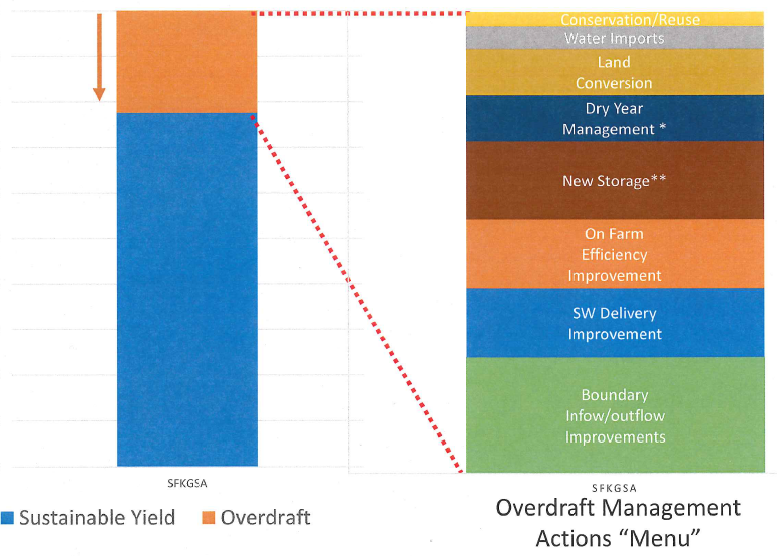 The South Fork Kings GSA is considering a “menu” of these overdraft management items, broken into several categories presented by the GSA’s technical consultant Geosyntec. The management action “menu” in the above image represents possible solutions to correct groundwater overdraft. Overdraft is represented by the orange bar on the left of the image. 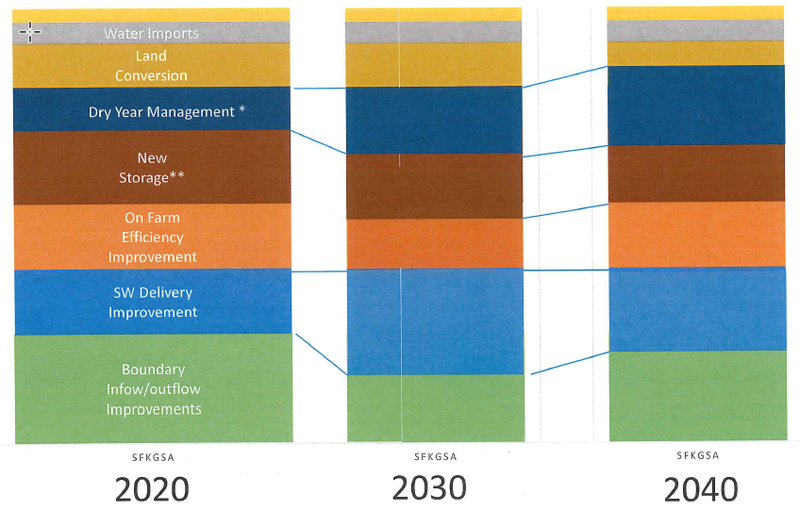 The menu items: conservation/reuse, water imports, land conversion, dry year management, new storage, on farm efficiency improvement, surface water delivery improvement, are represented by varying colored bars. Acknowledging resource scarcity, the variance in menu item size is proportional to the number of actions pursued within the menu item by the GSA. For example, this menu shows boundary inflow/outflow improvements holding the largest proportion of the management action menu, meaning it will consume a larger portion of the GSA’s solutions than all other listed items. As the South Fork Kings GSA periodically monitors progress toward its 2040 sustainability goal, adjustments may be made to the proportion assigned to the menu items. For example, the figure below illustrates a scenario in which the GSA decides in 2030 to increase surface water delivery and decrease boundary inflow/outflow improvements, among other adjustments. The illustration shows modifications to the menu again in 2040. The South Fork Kings GSA is working to refine its understanding of the current problem so it can best allocate resources to the most efficient and effective proportion of menu item solutions. But the implementation of groundwater sustainability will inevitably be an iterative process requiring adjustments over time. These adjustments may be made for a variety of reasons, such as an increase in data to inform trends, financial/economic factors, and/or fluctuations in water availability. The Tulare Lake Subbasin will submit one Groundwater Sustainability Plan to CA DWR in January 2020, but GSP implementation in the South Fork Kings GSA service area is up to the discretion of the GSA; varying projects and management actions to benefit the service area will be considered and approved by the South Fork Kings GSA Board.